Check out this brief history of the Greasepole, find out how to play, and scan the glossary of Queen's lingo so you're in on the in-jokes. Looking for technical information instead? It's here. October 8th, 1955, Varsity Stadium, University of Toronto. The University of Toronto staff watch proudly as the football game against Queens University comes to an end. Thanks to their new "indestructible goals," this will be the first Queens victory that wont end with the visiting fans taking home the goalposts. Queens students rush the field, give the goalposts a collective heave, and down they come. The night before the game, an undercover team of Queens engineers had cut partway through the two north-end poles, leaving just enough uncut metal to support them during the game. The poles were spirited off to Kingston and put to good use. 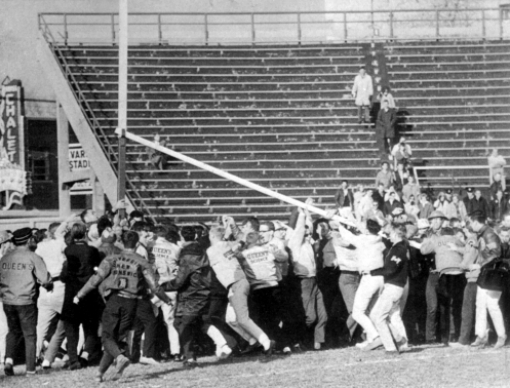 The engineers of Queens Applied Science class of 59 reenacted an old tradition: cover a goalpost in grease, nail a Scottish tam to the top, and initiate the first-year students by having them find some way to get the tam off! Todays Greasepole events are a far cry from the climbs of the 1960s and 1970s. Axle grease has given way to three inches of lanolin oil as a goopier but more sanitary Greasepole lubricant. Four hundred frosh (first-year students) arrive by bus and are welcomed with a roar from a purple-dyed crowd. Music blares from a podium from which the Engineering Society president looks down with pride, and the frosh leap into a pit filled waist-deep in clean but frigid water. 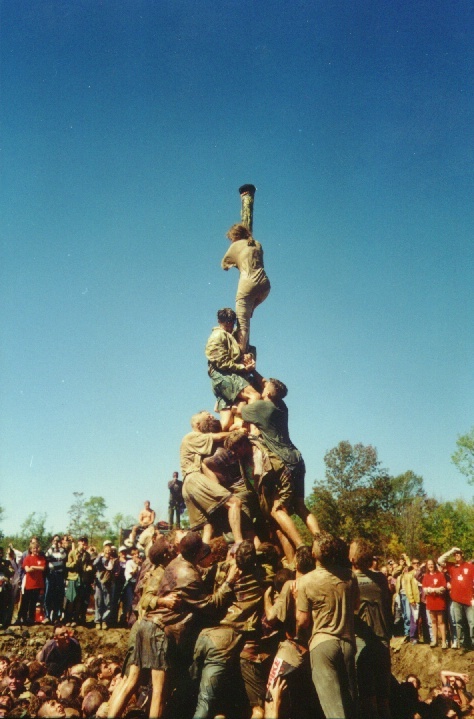 Unlike axle grease, a coat of lanolin makes the pole impossible to scale, and so todays frosh must learn to work as a team, form a human pyramid and remove the tam from the top. If they take too long, upper-year students are invited to help the frosh in their efforts. It is perhaps the only time in their academic careers that all the engineers at Queens work towards a common goal. and classes begin on Monday morning. The Pole Game begins as 85 frosh are tossed into the pit through a roaring crowd. You view the action through the eyes of a Frec (upper-year student) standing on the bank of the pit. You and some of your co-Frecs have noticed that the frosh this year are particularly keen. Its likely theyll climb the pole in record time, which would mean two things. First of all, they'd disgrace your year, and you just can't have that. But more importantly, they won't learn the teamwork skills theyll need to survive their upcoming Applied Science education. You have to stall the frosh for as long as possible as they attempt to climb the Greasepole. As the game progresses, the frosh will learn new tricks, become more resilient to your attempts to stall them, and genuinely learn to work together. Should they have problems, they will be assisted by Alan "Pop Boy" Burchell, an upper-year student who will jump into the pit and teach them some new tricks. Click the left mouse button to toss whatever is in your hands towards the pulsing crosshairs. If you are holding an apple, hold down the button to wind up. A power bar at the upper-left corner of the screen will indicate your wind-up strength. Click on apples, pizza, beer and exams that are offered to you with the left mouse button to grab them. Click on the firehose if it is offered. A power bar at the upper-left of the screen will indicate the water remaining in the firetruck. Click on the icons of apple, pizza, beer and exams to toggle between weapons, or else click the right mouse button anywhere on the screen. Click on ArtSci (Arts and Science) and Commie (Commerce) students with the left mouse button to push them into the pit. Should the Iron Ring forge swing out three times, click on the spinning Iron Ring that appears to unleash its powers. Unleash the power of the mighty Iron Ring. Here is a synopsis of the "tools" available for you at the greasepit. You can wield pizza in the game by grabbing it from the delivery guy who pops up at the front of the screen. This staple food of University students everywhere also doubles as a pit-side tool. Toss it sidearm into the pit by clicking the left mouse button. Its not a very effective "weapon," but a hungry frosh that catches the pizza may stop to eat it. Hurling it in the water is more strategic  frosh who have high hunger drives may come running for the slice. Eating pizza stalls a frosh, but also sates their hunger and increases their strength. 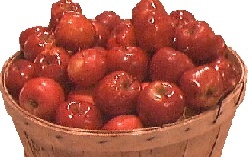 Two crowd members occasionally offer you a basket of apples during the game. You can click the left mouse button to throw, or click and hold the left mouse button to wind up a stronger shot. Apples can also be tossed at the Crowd, the Engineering Society President, and just about anywhere else youd like to cause unrest. How do you like them apples? Your ability to knock frosh down is a function of their strength. As the game progresses, the frosh will become increasingly resilient. 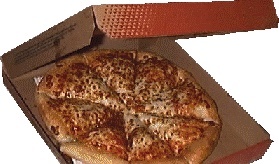 Eating pizza, for example, increases their ability to withstand an apple toss. Being hit with an apple first lowers a froshs strength, but then raises it above its original level. This is meant to reflect an increased resolve to avoid being knocked down by another apple, as well as an increased understanding of how to avoid being affected by an apple attack. Clearly the apples are only a short-term solution, even when thrown after length wind-ups. An inebriated member of the crowd occasionally offers you a keg of beer that can be used to fill up your Clark Hall Pub mug. 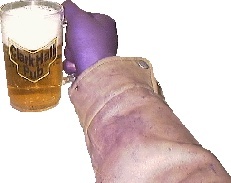 It would be a shame for it to go to waste, so use the right mouse button to drink from the elixir. If you're willing to click the left mouse button and part with some of it, the allure and subsequent effects of 6.5% ethanol can be put to good use. As with the pizza, a thirsty frosh may grab the beer and chug it. Tossing a mug of beer into the water can result in a free-for-all in which the frosh go scrambling for the prize. Drinking beer lowers the intelligence of a frosh, and sometimes has the immediate effect of having them do something stupid (like jumping off the pyramid, or stopping to sing). However, it has the effect of increasing their strength (perhaps their perceived strength?) and also sating their desire for more beer. Once ranked the third most hideous piece of paper on the planet, Phys 114 exams should be handled with care. In the game, some keener has brought his old exams to the pit and occasionally offers one to you. Click the right mouse button to check your examination paper over and make sure there are no pages missing. (There are instructions for how to build a "Spam Cannon" on the paper. A Spam Cannon is essentially a modified Potato Gun.) Click the left mouse button to toss an exam at the frosh. The frosh will scatter in every direction. Only a frosh with an extremely high intelligence level will not be affected by the exam. The 114 Exam thus gives new meaning to the phrase "smart bomb." Tossing the 114 exam at the frosh can devastate their attempt to form a pyramid, but it also increases their overall intelligence level quite a bit. Perhaps theyre learning by osmosis. The CD booklet explains that someone this year has a friend at the fire department. Theyve brought a fire truck to the pit so that the Frecs can get the frosh hosed. The firehose is in the game for "fun" more than anything else. It sends the frosh flying, but like the apples, it ends up increasing their strength. 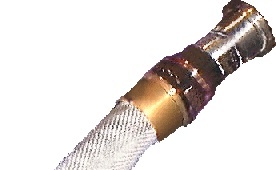 A meter at the top of the screen indicates how much longer the hose can run before it runs out of water. Water drips out fairly quickly even if youre not actively spraying. Arts and Science Students: theyre cute, they're lovable, but they don't belong at a private engineering event. If one shows up, give 'em a shove with the left mouse button. Many of the frosh will stop what theyre doing to come and splash the alien in the pit. 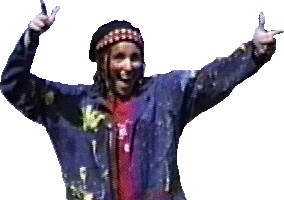 The thrill of splashing ArtScis, however, tapers off fairly quickly after the first splash attack or two. Commerce Students: See "ArtScis" above, but omit the "cute" and "lovable" bits. What more can one say about Commies that won't end with a million-dollar lawsuit? A click of the left mouse button is worth a thousand words. The Golden Word blimp occasionally flies by and launches a cartoon hippopotamus at the frosh to confuse them. 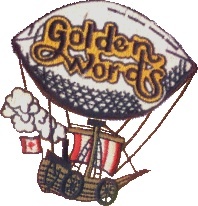 Golden Words is the campus engineering newspaper; the blimp is found on their masthead and the hippo is their mascot. The hippo causes some unrest and marginally affects the intelligence level of the frosh it touches. Theres no real way to "induce" a blimp attack; its just a fun random event. Every graduate of a Canadian engineering program wears an iron ring on the little finger of his or her working hand. The ring itself symbolizes both the pride we have in our profession and, at the same time, our humility. The rings were originally crafted from the twisted iron that remained after the first bridge ever constructed in the province of Quebec collapsed due to a design flaw. A subsequent inquiry revealed the flaw to have resulted from an error in judgement made by the bridge's engineers. In the Pole Game, you can earn the right to don your iron ring at the greasepit. If you can keep the crowd, the Engineering Society President and Al "Pop Boy" Burchell excited and happy, an Iron Ring Forge will swing on to the screen and begin pressing your ring. After it has swung out three times, your ring is forged and you can put it on by clicking the icon of a spinning ring with your left mouse button. The rings effect in the game is both symbolic and humorous. It temporarily turns the frosh into animals  sheep, and cows with the wings of eagles. The sheep poke fun at the "brainwashing" that goes on during frosh Week, and the tendency the frosh have to follow like sheep just about anything their Frecs do or say. The cows with wings of eagles are a reference to a chant sung during orientation week, which the author shall not be repeat here but is more than willing to sing upon request. Feeding the crowd pizza and beer (especially until they "slam their jackets"  a tradition among Engineers at Queens). and others that are just too cool to give away here. After the human pyramid topples a half-dozen times, the Engineering Society president invites Al "Pop Boy" Burchell into the pit to help the frosh out. Al is a local legend who stands over six foot five and has been of real assistance at the Greasepole in years past. His effect is twofold: First, he strengthens the base of the pyramid by the equivalent of five frosh; second, he teaches the frosh climbing and balancing techniques that would otherwise take them a great deal of time to learn individually. Synonym for engineering. The two are used interchangeably at Queens. An Arts and Science undergraduate student at Queens. The "watering hole" of choice for engineers at Queens. Also referred to locally as the "Center of the Universe." The pub is located immediately above the bookstore and adjacent to the Engineering Society offices and lounge. A Commerce undergraduate student at Queens. Lab notes, complete with answers, handed down to Frosh from upper-year students. A great blessing. Queens engineering orientation leader  these are the second-year students who welcome the new students to Queens. Theyre typically sporting mohawk hairdos ("EngCuts") and covered in gentian violet dye (hence the purple colour) and are sporting gold leather jackets. 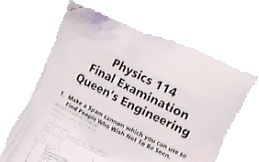 First-year Queens student (in the context of this document, typically a first-year Queens Applied Science student). A medical dye; active ingredient potassium permangenate (KMnO4. Great for "purpling" jackets and bodies. The humorous engineering newspaper published weekly at Queens. Their masthead features a blimp, and their mascot is a black-and-white hippopotamus. The behavior-based artificial intelligence system that governs the behavior of the frosh and every other character in the Pole Game. "Trial by fire" first-year Engineering course. If you can make it through 114, youll survive the program. The appropriate response to "How hards 114, frosh?" is, "Soooooooo Hard!" First year Applied Science Vice President, whose responsibilities include filling the pop machine at the Engineering Society in Clark Hall. 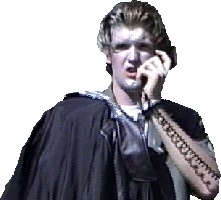 Six-foot-five local legend Alan "Pop Boy" Burchell was VP and of Science 99 from 1995-1996. (verb) To cover with Gentian Violet medical dye (see "Gentian Violet" above). The act of covering an object or body with Gentian Violet medical dye. Science Constables; the student regulation force on campus. Short for "Applied Science" (see "Applied Science" above). The greatest punishment a Science Constable can administer. A Tri Pub Ban prohibits you from visiting Clark Hall Pub, Alfies Pub or the Queens Pub for the remainder of the academic year.